Some good news for 3D Vision users, the just announced Nvidia G-SYNC technology will also work in stereoscopic 3D mode when playing games with 3D Vision as well by eliminating screen tearing, input lag, and stutter. All you will need to do is have a Kepler-based graphics card like at least GeForce GTX 650 Ti Boost and get a G-SYNC-enabled monitor or get a DIY Upgrade kit for an ASUS VG248QE monitor if you already have the monitor available. Nvidia says that the first DIY Upgrade modules will be shipping later this year for the most eager users willing to try the new technology. 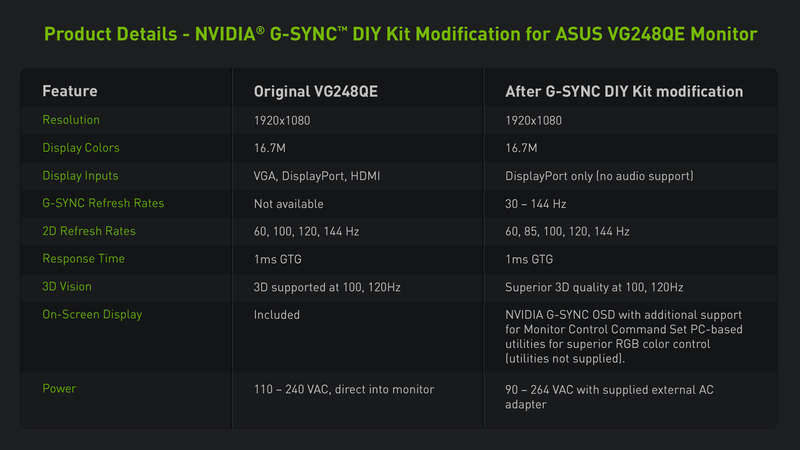 The Nvidia G-SYNC Do-it-yourself kit will cost approximately $175 USD and come with 1 year warranty. And next year we are supposedly going to see new models coming out on the market with built-in G-SYNC modules from Asus, BenQ, Philips and ViewSonic with displays even going up to 4K resolution. Nvidia G-SYNC requires Microsoft Windows 7, 8 or 8.1 and apparently older versions of the OS will not be supported and of course it will only work with compatible Nvidia-based GPUs and G-SYNC enabled monitors, so no go for AMD graphics with a G-SYNC monitor. Multi-monitor surround configurations will also be supported if you have all G-SYNC-enabled monitors, as well as SLI setups with multiple Kepler-based GPUs that meet the minimum requirements for G-SYNC to work. G-SYNC is supposed to work with all games, though apparently some games might have issues and Nvidia will be giving the user the ability to disable G-SYNC from the control panel of the drivers on per game basis. Also games that Nvidia discovers that have trouble with G-SYNC will be disabled by default in the driver (more game profiles) and the video driver needs to be version 331.58 or higher (not yet publicly released) in order for you to have G-SYNC support available. 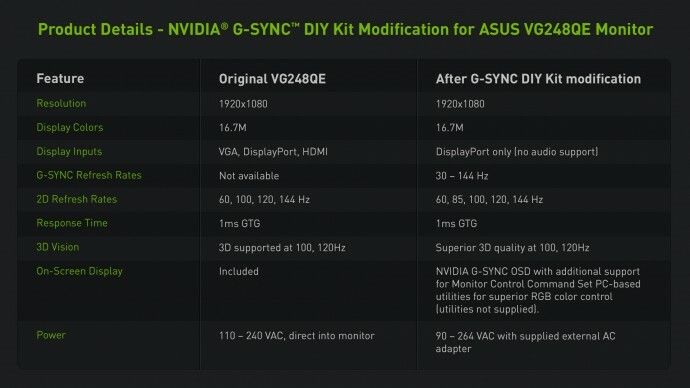 Note that after installing an Nvidia G-SYNC module in the ASUS VG248QE monitor and this should be also true for the upcoming monitors with the module built-in you are going to be able to use it only through the DisplayPort interface with no audio being transmitted along the video signal. Apparently only the Display Port interface allows for the tear-free, faster and smoother variable fps to be achieved when synchronizing the monitor to the output of the GPU, instead of the GPU to the monitor. Also note that the minimum refresh rate with the G-SYNC module will be 30 fps, so apparently even at 30 frames per second thing should feel very smooth and responsive all the way up to the maximum refresh rate of the monitor with in the case of the ASUS VG248QE is 144Hz. Indigomod, the DirectX 11 Wrapper for fixing 3D Vision shader issues that was mentioned here on the blog last month is now available for free and with a new name, apparently the project is now called 3DMigoto (Japanese for splendid, magnificent, beautiful). The guys behind the project have released both a beta version of the 3DMigoto wrapper itself as well as the wrapper packaged as a patch for fixing the shaders of the game Bioshock Infinite. 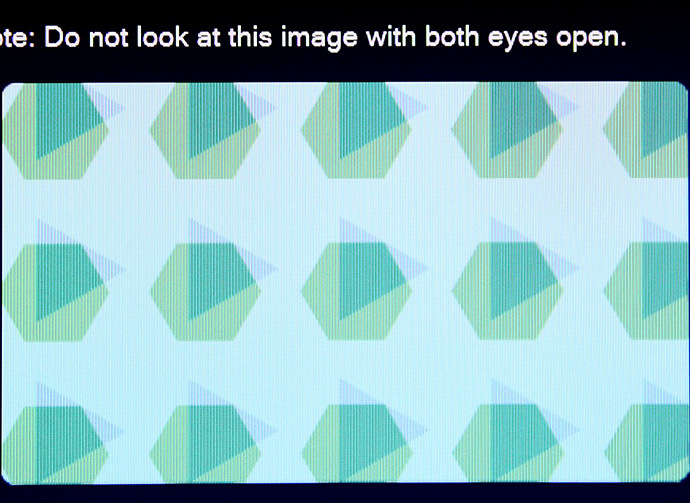 Unfortunately there is not a lot of information or documentation to help you get started with the wrapper if you are not familiar on how to use it to remove or rewrite problematic shaders for stereoscopic 3D rendering, so that a DirectX 11 game that does not work well with 3D Vision’s stereoscopic 3D rendering method by default can look properly. So you will have to kind of learn on the go, especially considering that the wrapper also has some interesting extra features available besides shader modification. Just as a reminder, Helix has also released a version of his wrapper for DX11 along with patched shaders for the game Bioshock Infinite that you can download and try.